Police officers outside the apartment building where the police dog was killed by a crazed Syrian. A Syrian man, 26, who killed a police dog with an ax and attacked police officers was shot in the city of Schiedam in the Netherlands Wednesday. 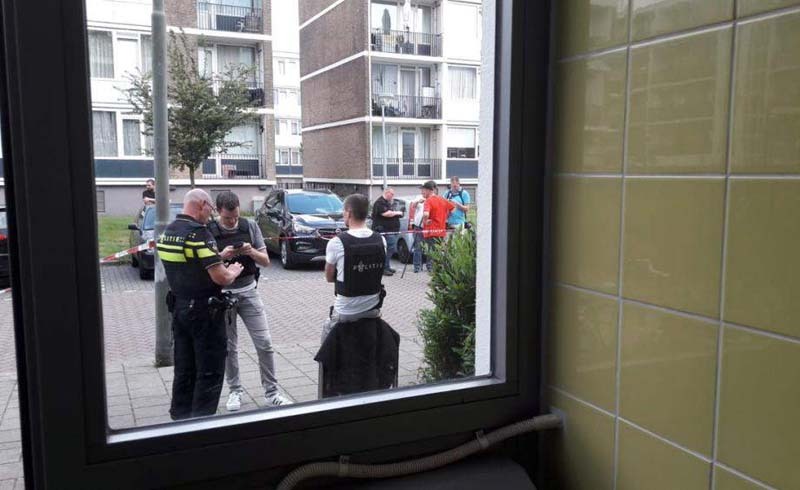 Around 1:30 PM, Police received a report about a man who was standing on his balcony, waving a ax and crying “Allahu Akbar.” Police officers responded first by trying to calm the man down, hand, having failed that, a SWAT team forced its way into the apartment. The man attacked the SWAT team, and in the process critically injured a police dog. The officers used a taser on the man but that didn’t seem to slow him down, at which point one officer shot him in the leg. The police dog died of its injuries. The suspect was taken to hospital.